Comedian Rick Cormier of Chelmsford is the guy you should see if you want to spend the night laughing. “I started about five years ago. My wife and I were talking about divorce and I needed some other diversion I guess,” said Cormier. Developing his parodies he started submitting them to amiright.com followed by soundclick.com and has roughly 30 parodies to this day. “To much acclaim, a lot of them got a lot of favorable reviews and then I started recording those,” said Cormier. Cormier said his first parody was written for a friend who was getting married for the second time. He explained that his wife’s name was Maureen as everyone called her Mo. “What I did was a parody to Frank Sinatra’s ‘My Way’ and called it ‘Mo’s Way.”’ Cormier said it was a big hit singing the song at his friends wedding so he figured he would perform parodies live. “Please Mr. Postman to She’s Lindsey Lohan” and “I left my heart in San Francisco to I wrecked my heart with spam and Crisco” are other parodies Cormier put together. In Cormier’s career as a comedian he has appeared at a comedy studio in Boston, Giggles Comedy Club, Elks Halls, VFWs and Knights of Columbus’ and the Lowell Brewery. He has worked with comics such as Dave Russo, Larry Lee Lewis, Steve Sweeney, Ira Proctor, Paul Nardizzi, Mike Donavan, Artie Januario, and Johnny Joyce. Looking at other comics, Cormier said he always has been a fan of Rodney Dangerfield, Red Skelton, Bob Hope, Milton Berle, Rich Little, Billy Crystal, Steve Martin, Jonathan Winters, and Monty Python. 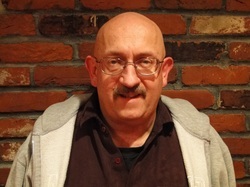 Cormier likes Frank Sinatra and The Beatles, and does “A day in the exodus.” He said this is the story of Moses set to a day in the life of The Beatles and has a lot of sound bites in it that he got off the Internet. “I put Cheech and Chong in there. I did both Cheech and Chong and I have Charlton Heston in there from the 10 Commandments,” said Cormier. Sometimes Cormier does his own soundtracks and will work with mini-tracks isolating each instrument individually making the sound better and more realistic. In life, Cormier is looking for a full time job while he sticks with comedy part time. He would like to become a recording engineer and has the qualifications to do so. “I already know how to do it. I know the software, and can work with audio files. I know how to mix and edit. I know all of that stuff,” said Cormier. 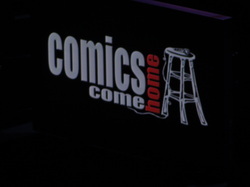 Comics Come Home brought nearly 6,000 people to the Agganis Arena in their 15th year. Saturday, Nov. 7, the night featured 10 comics as it sponsored the Cam Neely Foundation. Talking to Cam about the foundation, he said, “Basically we raise money for cancer patients and their families through various programs,” explaining that it started with The Neely House, and helped over 5,000 families. Walking into the arena, two huge televisions were set up hanging over the stage. Just before the actual comedy show began, John Stewart had a message for Comics Come Home. Leary said there is going to be two more seasons of Rescue Me, and next years episodes will kick off in May. Starting the show, Leary went off in a tangent about the Yankees wishing Mariano Rivera’s arms would fall off, and Kate Hudson would throw A-Rod’s engagement ring to his feet. Ranting about The Biggest Loser, Leary said the only reason these people are losing weight is because they are either passing gas, or picking their nose. Following Leary was Tony V telling the audience to forgive him for his appearance because that is what he looks like. He ended that bit saying he believes Captain Morgan is a pirate because he has hijacked him more then once. Kenny Rogerson took the mike from V next and brought up the fact that Christmas is coming. Closing his act, Fallon impersonated Jerry Seinfeld, Bill Cosby, Chris Rock, Richard Lewis, Robin Williams, Lora Domai, Mitch Hedberg, Gilbert Gottfried, Larry The Cable Guy, Stephen Wright, Adam Sandler, and tried to imitate Eddie Murphy. The audience was in hysterics when he said, “Black people do not like hockey,” impersonating Rock. Whitney Cummings laughed up a storm joking about strip clubs telling everyone that most of her friends are getting married, therefore she has been going to a lot of these clubs. “The funniest thing to me about male strippers is they are always are in police uniforms, firemen uniforms, because they say women like men in uniform, right? We don't like men in uniform, we like men with jobs,” joked Cummings. Right before Cummings left the stage, she talked about how girlfriends nowadays send their boyfriends pictures to their cell phones showing them what’s waiting at home. “If I was going to take a here’s what’s happening photo shoot, I would take some pictures of the…dishes, or the bills,” said Cummings. Lenny Clarke then took the mike telling the audience that Curt and Shonda Schilling were in the crowd celebrating their 17th anniversary of marriage. “I myself have been happily married for 35 years, five different women, but I’m no…quitter,” said Clarke. After Clarke, Adam Ferrara came to the stage saying he recently just came back from Jamaica flying Air Jamaica. Bringing up the topic of Michael Vick playing football again, comedian Patrice Oneal is perfectly okay with that. Oneal said Vick did his time in jail and should be able to do whatever he wants now that he is out, and not have to apologize for anything. Oneal went on saying the reason he keeps doing it is because he is good at it. After Oneal’s “time” on stage, host Leary introduced the next comedian Jeffrey Ross. In his second year at Comics Come Home, Ross said B.U. was his alma mater. “B.U. is finally getting recognized, I’m just kidding. B.U. has always been a great conglomerate, always taking over Boston, and now it’s unreal,” said Ross who recently came out with a book titled “I Only Roast the Ones I love. “It’s a how to for making fun of people without upsetting them,” said Ross. Lastly, Bill Burr closed the night blowing the audience away with his lunch joke. Before he closed the night however, he told me he was in a movie called Date Night this past summer, and has been in four Comics Come Home shows. Burr said when Leary called him the first year he appeared in the lineup he was star struck. He left a message saying, “Hey, Billy, this is Denis. You’re really…funny, thank you for coming on, something like that,” said Burr. “I went to order a turkey sandwich the other day,” said Burr explaining that he wanted lettuce, tomatoes, and mayonnaise on Rye. “They go, ‘turkey sandwich, lettuce tomato on Rye.’” At this time, Burr agrees with them telling them he also wants mayonnaise. Burr then told the sandwich maker that he paid full price for everything and he refuses to do work he should be doing. After Burr’s performance, Leary sang the A-Hole song. Listen to the A-Hole song by going to www.youtube.com/watch?v=OzoPTtTfcrA. For more about the Cam Neely Foundation, go to www.camneelyfoundation.com. For more information about Shawn Hansen’s Comedy Corner, go to: www.shawnhansenscomedycorner.blogspot.com.